To save time and repetition when configuring various aspects of your Smoothwall network infrastructure, you can create address objects and object groups. An address object is made of either a single IP address, an IP address range, or an IP subnet. You cannot have a combination of these in an IP address object. To do this, you must create an address object for each type, then create an address object group containing those objects. For example, if you create multiple rules to the same set of servers, you can reduce duplication by creating an address object made up of those server IP addresses. You can then create an address object group containing the server's address object, and any client addresses in the same subnet. • All individual interfaces that are not reached through an external interface, that is, basic interfaces, VLAN interfaces, and so on. • Any configured VPNs and other static routes that are reached through an external interface. • Any automatically detected DNS server (using the Smoothwall’s configuration). where PPPoE_interface is the configured name of the PPPoE connection. You will not see this pool if a PPPoE interface is not configured on your Smoothwall. For more information, see Using a Point-to-Point Protocol over Ethernet Interface . where PPPoE_interface is the configured name of the PPPoE connection. You may not see this pool if a PPPoE interface is not configured on your Smoothwall. 1. Go to Network > Settings > Address object manager. 2. Click Add new address object. • Address Names — Either enter the IP address, or IP address range in the box provided, or click the down arrow and select the relevant IP addresses, or ranges. IP addresses and ranges entered in Address Names appear in Selected objects. • Comment — Configure an optional comment for this address object. An additional button, Show comments, appears on the Address object manager table if any comments are configured. Clicking this displays configured comments under the rule. Address object manager also allows you to create nested address objects, that is, several child address objects under a parent address object. For example, in a corporate environment, you can create an address object for each subnet or team, linked to a parent address object for each building or branch. You can choose to create each address object separately, as described in Creating an Address Object, or create the whole structure at the same time. 3. Configure a meaningful Name for the parent address object. • Address Names — Enter the IP address, or IP address range in the box provided for one of the child address objects. • Options — Select Save selected objects as group. • Group name — This box is now visible. Configure a meaningful name for this child address object. Click Add. The Smoothwall replaces all items in Selected objects with the name configured in Group name. 5. Remove the new address object in Selected objects by clicking the accompanying red cross. 6. Repeat the above until all child address objects are created. 7. Click inside Address Names to display all configured address objects. 8. Select all relevant child address objects. 9. Remove the tick for Save selected objects as group. 10. Configure an optional Comment for this address object. 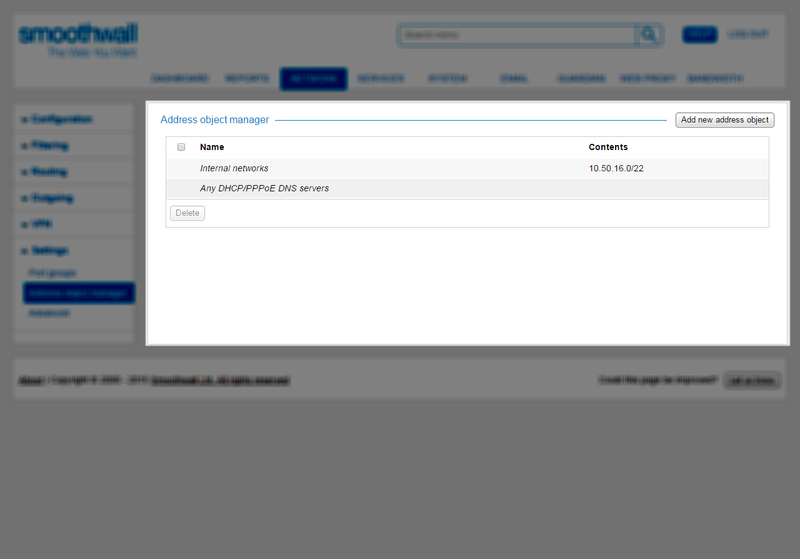  From either the Source IP addresses or Destination IP addresses field, you have clicked Create. 1. From the Add new address object dialog, select a Type of New address object. 2. Configure a meaningful Name for this address object. If the address object contains a single IP address, it is recommended you use the IP address as the Name for easier searching. 3. Within the Address text box, enter the relevant IP address, IP address range, or IP address subnet. 4. If required, configured an optional Comment describing this address object. Note: You cannot edit or delete existing address objects from the Add <type> rule dialog. You can only do these from the Network > Settings > Address object manager page. 1. From the Add new address object dialog, select a Type of New address object group. 2. Configure a meaningful Name for this address object group. 3. From Address objects, select the relevant address objects for this group. 6. If required, configured an optional Comment describing this address object group. Note: You cannot edit or delete existing address object groups from the Add <type> rule dialog. You can only do these from the Network > Settings > Address object manager page. 2. From the Address object manager table, highlight the relevant address object. 4. Adjust the configuration as required. For a detailed description of each setting, see Creating an Address Object. Note: You cannot delete address objects that are assigned elsewhere, for example, used as part of a port forwarding rule (see Working with Port Forwards) or source NAT policy (see Using Source NAT-ing and LLB Rules). 2. From the Address object manager table, locate and highlight the relevant rule. 2. From the Address object manger table, mark each address object for deletion by selecting the check box to the left of Name.